Ovarian cysts are small fluid-filled sacs that develop on a woman's ovaries. Cysts are very commonly found in women who have polycystic ovary syndrome and are, in fact, one of the defining characteristics of the disease. These occur when your body begins growing an egg follicle that does not fully develop/release a mature egg at the end of the menstrual cycle. 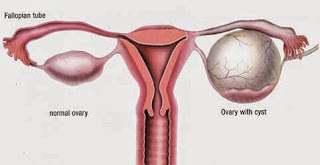 Ovarian Cystectomy is the surgical way of removing the cyst in the ovary. Ovarian cysts that do not disappear on their own or those that are 4 to 8 centimeters in size may be removed by surgery to ensure that the cyst is not cancerous. Surgery may also be needed if some patients who are menopausal (the time in a woman's life in which the menstrual cycle ends). Surgery to remove an ovarian cyst may be done by a Cystectomy without removing the ovary. The Best way to remove ovarian cysts is Laparoscopic treatment. In Laparoscopic treatment, Laparoscopy is used to remove ovarian cysts in a less invasive way. Laparoscopic surgery involves the use of a laparoscope that is inserted through a small incision below the navel. A laparoscope is an endoscopic tube with a camera and light attached to it. Other tiny incisions are also made through which surgical instruments are inserted to remove the ovarian cyst. This procedure is best done by expert doctors in Bangalore at Rashmi Hospital with affordable cost.